The Wurlitzer building is an example of the early modernism style of architecture, with construction beginning in 1892 and continuing until 1950. The building’s proximity to the Erie Canal may have been part of the draw for Rudolph Wurlitzer; however, the structure itself was likely an attraction as well. It was large enough to accommodate everything he needed: "showrooms, customer and product training areas, public relations reception rooms, employee recreation areas, locker rooms, showers, and cafeterias." The Wurlitzer family began cultivating its reputation for making and selling fine musical instruments during the 17th century. The father of the original Wurlitzer company, Rudolph Wurlitzer, was born in Schilbach, Saxony in 1829. At age 24 he immigrated to America, and three years later, in 1856, he founded The Rudolph Wurlitzer Company in Cincinnati, Ohio. Initially he imported musical instruments from his family in Germany to sell them on the American market, but soon made his way into manufacturing. In 1880, the first Wurlitzer piano was built in the U.S., followed by the first coin-operated electric piano in 1896. This was just the beginning of what would prove to be a continuing success story as the first Wurlitzer jukebox was just a step away. The next major musical venture for Wurlitzer came with the introduction of cinema and theatre organs. These instruments, dubbed the "Mighty Wurlitzer", created an instant sensation when they appeared on the market during the silent movie era. The introduction of Wurlitzer-driven musical soundtracks to movies fostered dramatic changes within the motion picture and entertainment industries. Wurlitzer has historically implemented a philosophy still valid today of channeling flexibility and advanced technology into the development of innovative products. Consequently, Farny Wurlitzer, successor of the founding father, bought a patented jukebox mechanism in 1933 and hired highly skilled professionals for the design and marketing. From their new location in North Tonawanda, New York, these imaginative inventors developed the first Wurlitzer jukebox. Over the next few years Wurlitzer jukeboxes became widely embraced by operators, and by the late 1930’s Wurlitzer was producing over 45,000 jukeboxes a year. The jukebox became known as the "small man’s concert hall." The Wurlitzer Building in North Tonawanda, New York wasn’t alone in producing world-class musical instruments under the Wurlitzer name. With executive offices in Chicago, the company also had production facilities in Mississippi and Illinois. 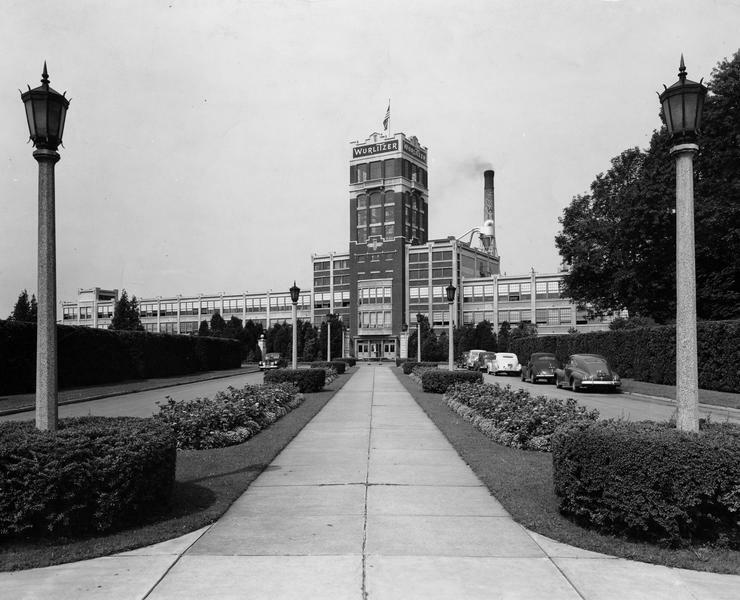 However, the North Tonawanda facility had the distinction of being the largest musical instrument plant in the world at the time. Although many products were created in the Wurlitzer Building, the "Mighty Wurlitzer" may be Rudolph Wurlitzer’s greatest legacy. They were a magnificent line of organs that could be found all over the world. Places like Rockefeller Center, Lincoln Center, the Hollywood Bowl, St. Patrick’s Cathedral, Metropolitan Opera Music Hall, and Kleinhans Music Hall were some of the better known venues to have embraced the concert grade organ. Copyright © 2016-2019 Wurlitzer Industrial Park.